Extinguisher is designed for explosion protection systems. Fenwal Firewolf(TM) extinguisher discharges explosion suppressant into protected volume in milliseconds. Extinguisher uses electromechanical operation and is designed to replace explosively operated actuators in industrial applications such as dust collectors, mills, dryers, and process equipment. Features include redundant motor and actuation electronics; continuous electronic monitoring of extinguisher pressure; and reset/recharge after actuation. Ashland, MA --- Fenwal Safety Systems, the world's leading manufacturer of explosion protection systems, has introduced the Fenwal Firewolf(TM) extinguisher, a state-of-the-art actuation device used to discharge an explosion suppressant into a protected volume in milliseconds. The Fenwal Firewolf extinguisher uses an electromechanical operation and is designed to replace explosively-operated actuators in a variety of industrial applications including dust collectors, mills, dryers, and other process equipment. 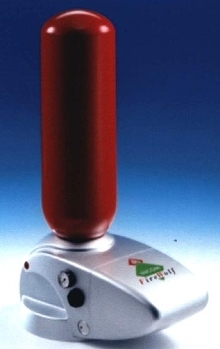 The Fenwal Firewolf extinguisher has an impressive list of features including: redundant motor and actuation electronics for unsurpassed reliability; continuous electronic monitoring of extinguisher pressure; simple reset and recharge after actuation; and no requirement for periodic replacement of actuation components. It can also be functionally tested while in service and satisfies the OSHA lockout/tagout requirement for stored energy equipment. The Fenwal Firewolf extinguisher is designed for use with a complete range of Fenwal pressure detectors and the innovative new Fenwal EX-200 control unit.